Several years ago a friend gave me hops plants, encouraging me to grow them, not because I love beer, but because I love bugs. Each year, she assured me, her bines are crawling with ladybugs and lacewings feasting on the aphids that load the leaves. The prospect of such a scenario won me over, and the hops have a home in the garden. I’ve watched and waited for the insects, but the outbreak of historic proportions never arrived. Until now. Cleaning up and trellising the overgrown mass, I got up close and personal with more aphids than was comfortable. True, they’re soft bodied and not aggressive, but the sheer numbers on the hops is alarming and the longer I worked with the bines, the more aphids I had crawling on me. Eventually I had to get the hoard off of me, and the stamping legs, shaking arms, and head flipping made my spouse think my iPod must be playing a rocking tune. But soon he noticed the moving mass of pale green slowly engulfing me, the fence, and everything else in their path, and rescued me with a series of well aimed thwacks from his gloves. We fled the area, telling ourselves that the ladybugs have it under control, but in truth those plants are on their own. A quick poll of gardeners this season shows many are fighting the same battle against that pear-shaped menace, which are rapidly turning our gardens into the Year of the Aphid. Aphids are small, soft bodied, sap-sucking pests, and Colorado has several hundred species in a variety of sizes and colors, from green to black, purple, and red. They feed by treating plants as their own personal big gulp, sucking the sap and reducing the plant’s vigor. Aphids are born pregnant, and reproduce so quickly they rapidly build up on the plant. But being soft bodied they’re easy to control. Grab the hose and attach a nozzle that can direct a strong jet of water onto the plant. The stream rips aphids from the stems. If they aren’t crushed by water pressure, at least they’re flung to the ground, and due to very poor eyesight, can’t find their way back. Insecticidal soap is excellent, provided the formula is made for the plant it’s sprayed upon. Always read the label of any spray to see if your plant is listed. Your plant must be mentioned on the label or chances are something about the spray will harm the plant. Leaf curl aphids pose a different problem by stimulating the leaf to form a protective tent around the aphid colony. This is a common problem on ash, plums and viburnums. 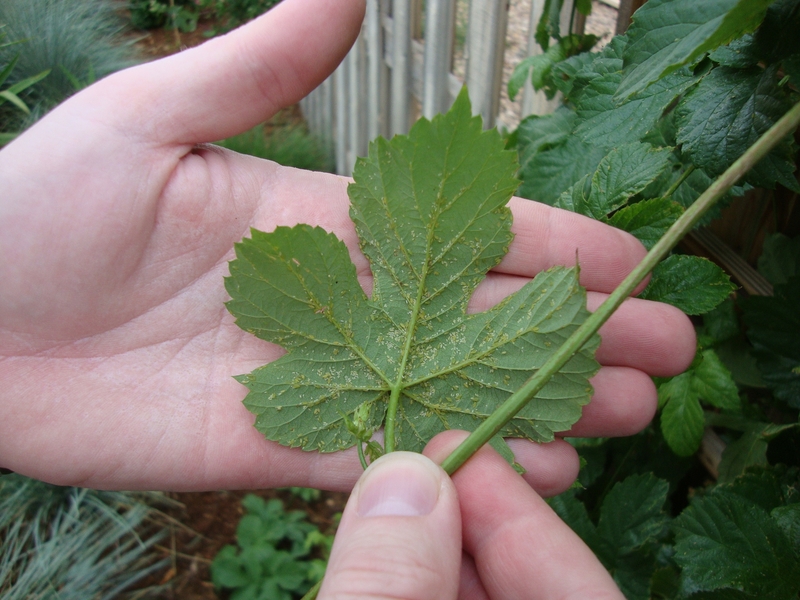 Within the leaf, the colony is protected from water sprays and insecticidal soap, but there are a few beneficial insects can wriggle in and wreak havoc on leaf curl aphids. If you’re brave enough, grab one of the leaf curls and unroll it, ignoring the sticky sap and crushed insects that coat your hands. Look for lady bug and lacewing larvae, or young syrphid flies, which are maggots. Not all beneficial insects look cuddly like the ladybug, and learning to recognize pest predators is a must for savvy gardeners. Check out the photos and information on Colorado State University Extension’s fact sheet . To encourage beneficials, avoid spraying broad-spectrum insecticides that kill both good and bad bugs.